River of Life Church (formerly known as First Mennonite Church Greendale) is located in the Greendale area of Chilliwack, British Columbia, approximately 60 miles / 100 kilometers east of Vancouver. 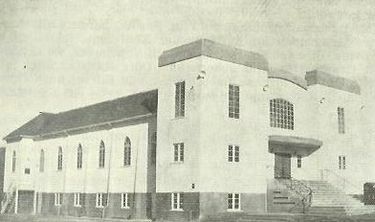 The first Conference of Mennonites church to be organized in British Columbia began here in 1928-29, when the first settlers came to the Sardis and Sumas areas from the prairie provinces of Canada and elsewhere. In April 1930 a large wooded area owned by the Northern Construction Company was subdivided into 28 lots of 18 to 25 acres each. The sale of this land was available only to Mennonites. This resulted in a significant increase in the number of Mennonite families in the area. At first the various families met in a chicken barn and the homes of Nicolai Bahnmann and Johann Reimer or outdoors, but eventually a meeting house was constructed in 1931. On 31 October 1931 the congregation was formally organized with 80 members as the First Mennonite Church of Sardis under the leadership of Elder Nicolai Bahnmann, and all the settlers of Mennonite Church background from both Yarrow and the Sardis and Sumas areas joined the congregation. The first meetinghouse was enlarged in 1941. In 1947 a new church measuring 50 by 100 feet and seating 1,200 was constructed, with a dedication service held on 2 November 1947. Greendale experienced the disastrous 1948 flood, when the waters rose to cover the floor of the church. The church building was destroyed by fire on 13 December 1955, most likely due to faulty wiring. On 2 September 1956 a new sanctuary built on the same foundation but with a smaller sanctuary and the addition of classrooms was dedicated. The building was renovated in 1986. In 1947, together with the nearby Greendale Mennonite Brethren congregation, they purchased land for a cemetery that was given the name Greendale. 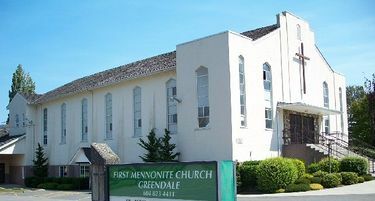 The congregation was then renamed the First Mennonite Church Greendale. The congregation reached its highest membership in 1959 with 310 members. At that time 92 members were over the age of 60. The congregation went through a difficult transition in language from German to English in the 1960s. The congregation had a strong Sunday School and youth work ministry from the early years of its existence. In 1930 the Maria-Martha Vereins (Maria-Martha Circle) was established by Katharina Friesen. In the late 1950s the members were farmers, most of them in berry farming. Services were conducted every Sunday in German; there was a Sunday school for the children, a chorus, a young people's organization, and three women's missionary societies. In 2006 the congregation left Mennonite Church Canada and became an Area Conference Only Member (ACOM). In May 2007 the congregation chose not to participate in the signing of a new covenant document drawn up by Mennonite Church British Columbia, and on 18 November 2007 the congregation voted to leave the area conference. The congregation changed its name to River of Life Church in 2012. Canadian Mennonite (17 December 2007): 15. Chilliwack Museum and Archives. "Community of Villages :Sumas/Greendale." Web. 16 October 2006. < http://chilliwack.museum.bc.ca/history/cov/sumas.htm>. CMC Nexus (April 1995): 11. Information bezueglich der Vereinigten Mennoniten Gemeinden in British Columbien: Gelegentlich der Konferenz der Mennoniten in Kanada, 1959. Abbotsford, BC: The Conference, 1959: 6. Lehn, Cornelia. Frontier challenge: a story of the Conference of Mennonites in British Columbia. Clearbrook, BC: The Conference of Mennonites in British Columbia, 1990. Mennonite Brethren Herald (23 March 1984): 6-8; (27 May 1988): 27. Mennonite Reporter (8 March 1976): 4; (14 April 1980): 14; (19 September 1994): 10. "New Mennonite Church Dedicated." Chilliwack Progress (5 November 2014): 13. Peters. G. I. A History of the First Mennonite Church Greendale B.C. Greendale, BC: First Mennonite Church, 1976. Mennonite Heritage Centre Archives, Winnipeg, Manitoba: First Mennonite Church Greendale (B.C.) fonds, Volumes 108, 1954, 2596, 2950, 4996, 5130. Mennonite Historical Society of British Columbia Archives, Abbotsford, BC: Church registers. Other ministers and elders have included Aron Jantzen, Henry H. Dueck, Johann J. Klassen, Gerhard Loewen, Abram Block, Jacob Penner, Gerhard I. Peters, Cornelius Matthies, Rudolph Froese, and Julius Thiessen. Tilitzky, Cornelius G. and Richard D. Thiessen. "River of Life Church (Chilliwack, British Columbia, Canada)." Global Anabaptist Mennonite Encyclopedia Online. September 2012. Web. 19 Apr 2019. http://gameo.org/index.php?title=River_of_Life_Church_(Chilliwack,_British_Columbia,_Canada)&oldid=140828. Tilitzky, Cornelius G. and Richard D. Thiessen. (September 2012). River of Life Church (Chilliwack, British Columbia, Canada). Global Anabaptist Mennonite Encyclopedia Online. Retrieved 19 April 2019, from http://gameo.org/index.php?title=River_of_Life_Church_(Chilliwack,_British_Columbia,_Canada)&oldid=140828. Adapted by permission of Herald Press, Harrisonburg, Virginia, from Mennonite Encyclopedia, Vol. 4, p. 422. All rights reserved. This page was last modified on 12 November 2016, at 07:48.